Although Studio 88's range of prints is very large and comprehensive, until recently we have only been able to publish editions of a relatively small proportion of the aviation paintings Michael Turner has created. However, thanks to the latest digital printing technology, we are now able to offer individually produced giclée prints from a much larger selection of his paintings. These prints are individually printed to order on very high quality heavyweight (300gsm) acid free art paper, using inks which provide the best colour and finest detail of any prints we offer. The whole process is under Graham Turner's control, and that, together with Michael's input and approval ensure excellent quality and a picture that is as close to the original as possible. All prints are individually signed on the border by the artist. There are a range of sizes to choose from and a selection of paintings are now also available reproduced on canvas. We can also offer a unique service - Custom Giclée Prints - individually produced prints from the majority of paintings Michael has ever painted, so if you have seen a painting - maybe in a book, at an exhibition, on a card or calendar - and been disappointed to find it not available as a print, this could well be the answer. Reproduced from a selection of Michael Turner's Aviation paintings, these 'prints' are individually printed on good quality canvas before being stretched on wooden stretcher bars - just like one of Michael's original oil or acrylic paintings. If you have seen a painting by Michael or Graham Turner - maybe in a book or at an exhibition - and been disappointed to find it not available as a print, we might be able to produce a giclée print of it for you - see this section for more details. 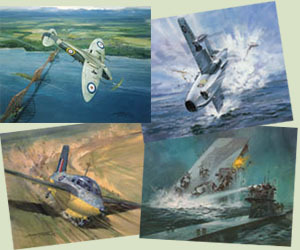 A collection of sixteen prints reproduced from Michael Turner's paintings that record significant episodes from the remarkable flying career of Captain Eric 'Winkle' Brown.